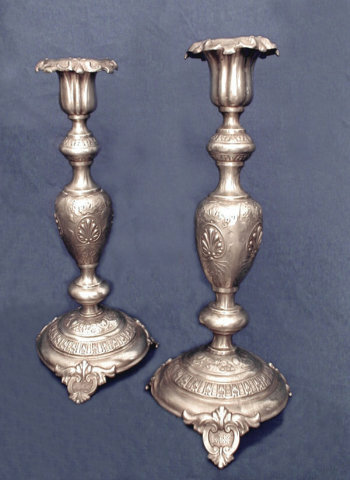 A pair of beautiful Sabbath Candlesticks, marked "Fraget N. Plaque" with the Polish eagle stamp. Made in Warsaw c. 1890-1900. Silverplated. Standing a majestic 15" tall, they have Baluster shaped stems on domed bases embossed with fruit and floral motif with tripod. Knopped above and below with Anthemion details, sprays of grape, ivy, wheat and florettes. Fluted candleholder with removable, matching bobeche.